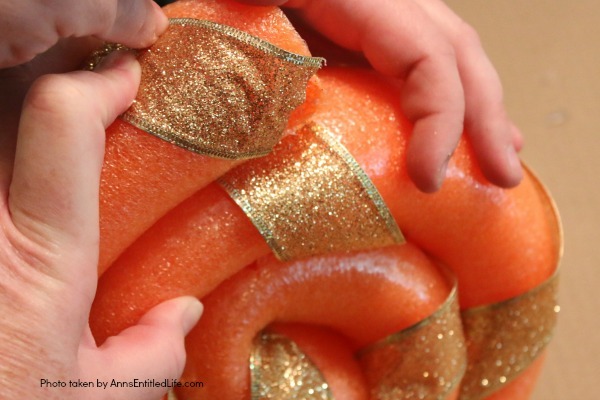 This is a fast and easy to make 15 minute craft, perfect for indoor or outdoor holiday decorating. 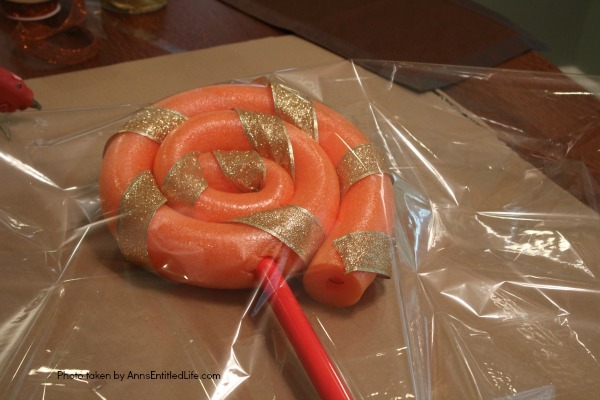 These low-cost pool noodle candy can be made in any color, so fully customizable to match your decorating color scheme! 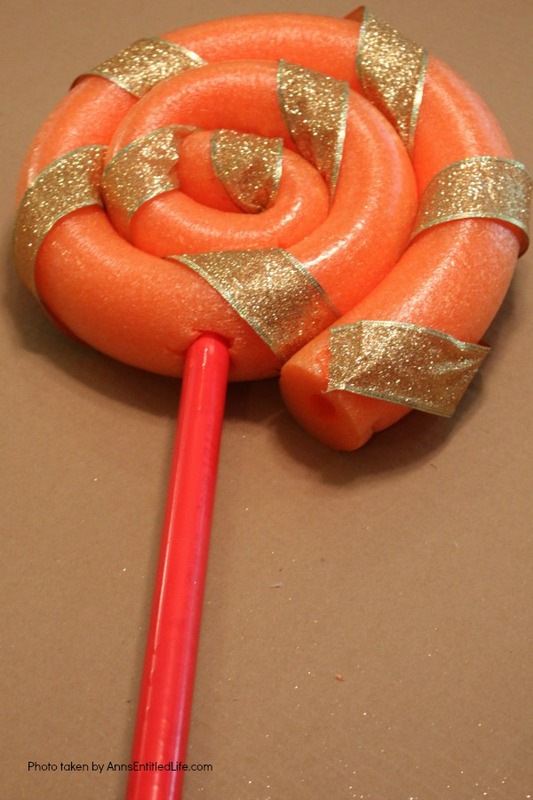 You could also use this for a Candyland party theme, Good Ship Lollipop school play, and more! One day I was wandering through Hobby Lobby (because I love that store), and I saw all these terrific lollipops made out of Styrofoam (indoor use). They were $6 – $12, and I asked my niece if we could do something like that for outside. The sticking point was what to use for the base. We talked about cutting PVC pipe, but that turned a simple craft into a PITA. Still, I was resigned as we could not think of a better option that would work for outdoors. So on one of Hubby’s 40,326,415 trips to Home Depot this past summer, I accompanied him to get PVC pipe to cut. But hold on now… no need! Home Depot had pre-cut PVC in the plumbing aisle that is 2 feet long, with various diameters. The one used in this project is ½” wide (the 1″ was just too wide). It retailed for $1.51. The pool noodle is a dollar at the dollar stores. 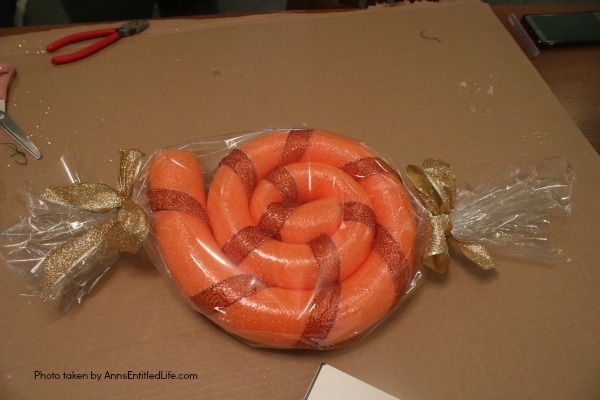 The cellophane and ribbon is the greatest cost, and even that can be found at the dollar store. 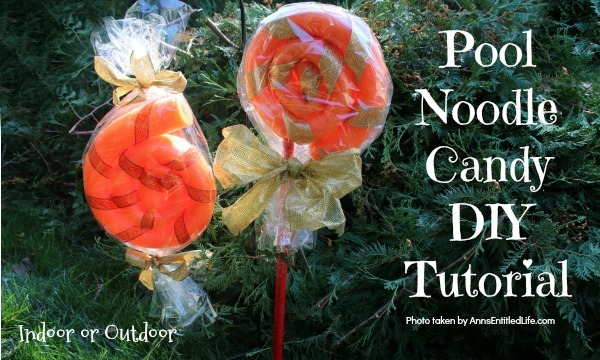 The two of these “candies” cost about $6 total to make! And they can be used outdoors! • These are VERY light. If you live in a windy area (like I do) keep that in mind and be prepared to ziptie the candy to your railings, or a garden hook. 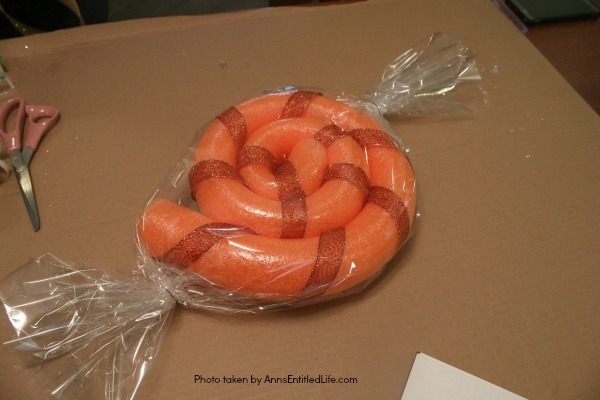 • You need a second pair of hands to hold the circular pool noodle in place while putting the wire through to hold it. • This is a 15 minute craft. The hardest part is starting the bend. 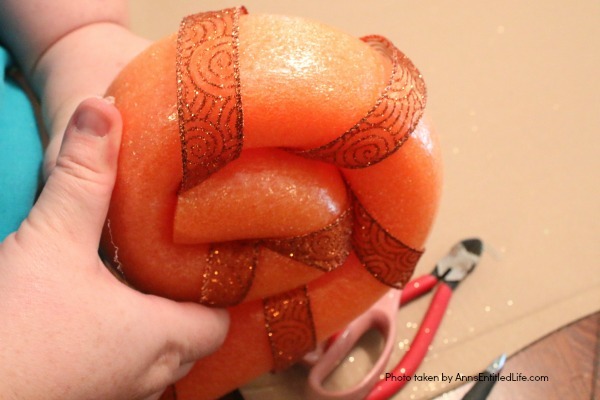 Truly a fast and easy holiday decor craft. 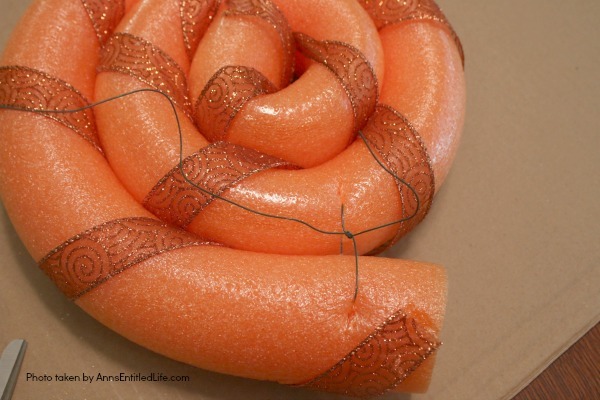 • Use a low-temp glue gun for this one as the hot glue can melt the pool noodle. 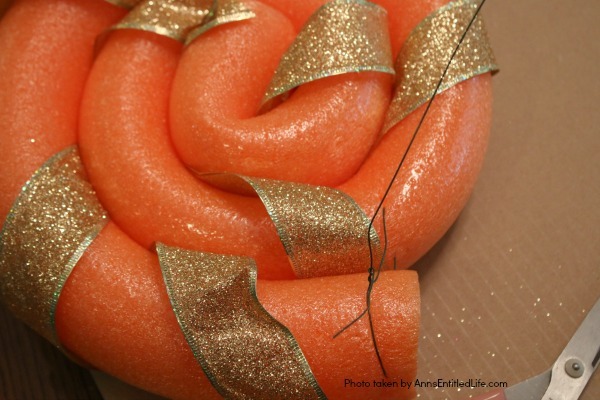 • Use a high contrast sparkly ribbon for great results! • Cover your work surface with a drop cloth or cardboard. • Painting the PVC is optional. It also makes this craft longer than 15 minutes due to dry-time. 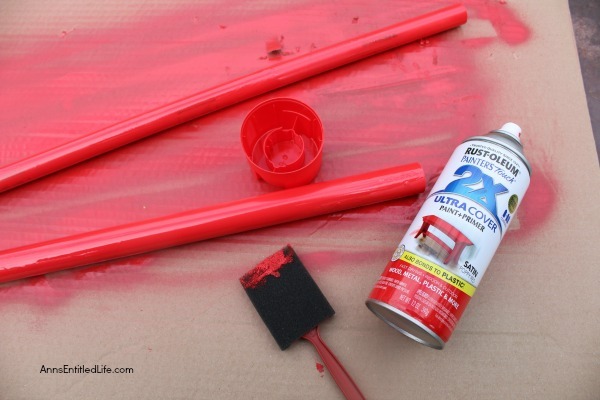 • Spray paint the PVC pipe the color of your choice. Choose a spray paint that will stick to plastic. Rustoleum 2x is perfect for this. Note: I did not prime this. I probably should have. It took three coats of spray paint to cover most of the stamped writing on my PVC pipes. • Smooth out any drips with a foam paint brush. 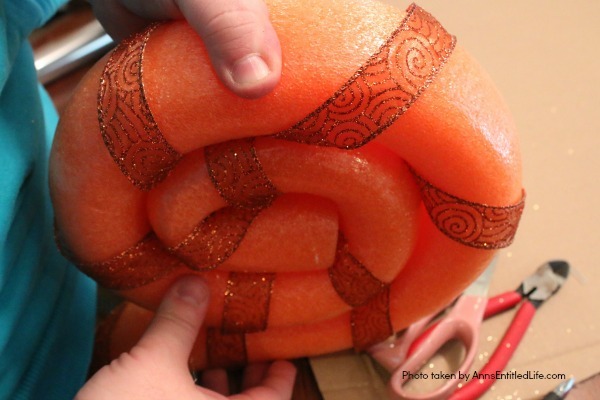 • Wrap the pool noodle with wired ribbon. 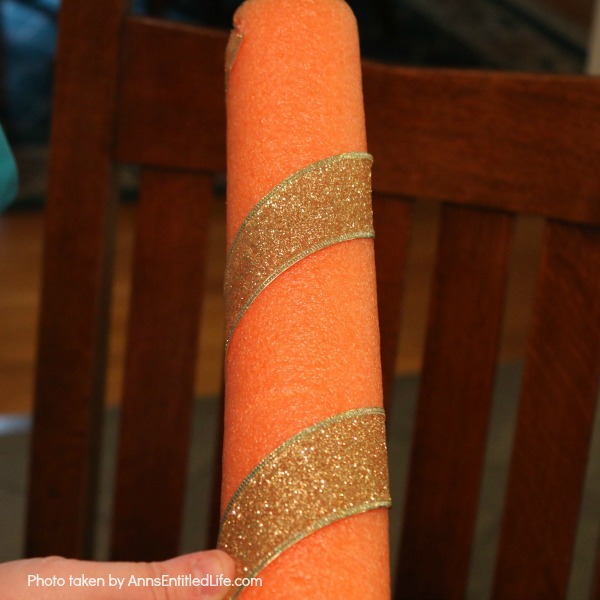 • Dab and hot glue ribbon to the ends of the pool noodle. 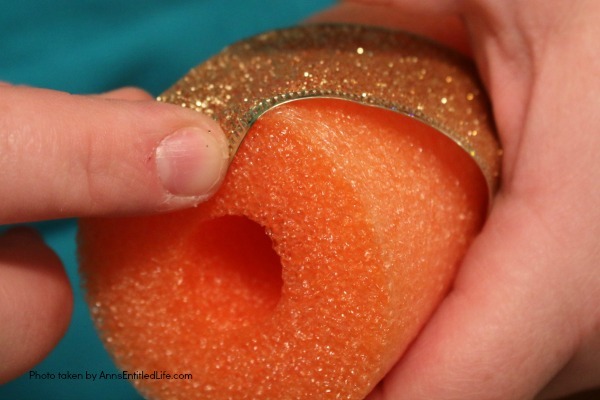 Since the pool noodle will melt with contact from the hot glue, but sure to glue lightly, and use a low-temp glue gun. Your ribbon will not be tight, but that does not matter for the final product. 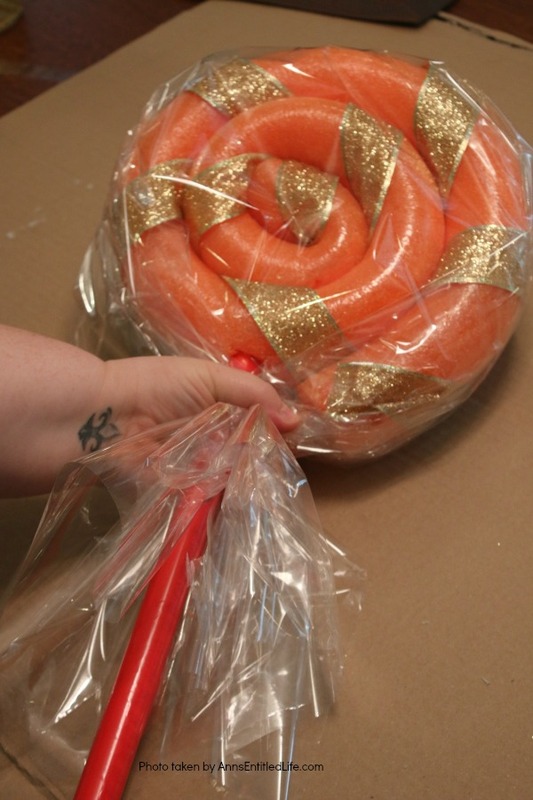 • Bend the pool noodle and start to wind it to form a lollipop shape. Continue until the whole pool noodle is wound. 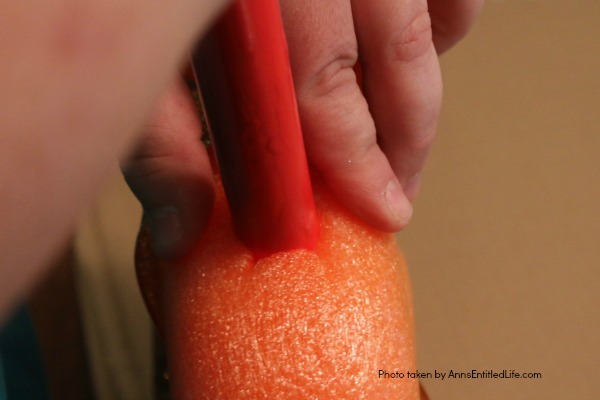 • Stick a wire stem through the end of the pool noodle, and loop through to the piece below, twist to hold. A second set of hands is VERY useful for this part of the craft. • Form an X with an X-Acto knife. • Insert your PVC pipe. Wedge and twist once you feel resistance. 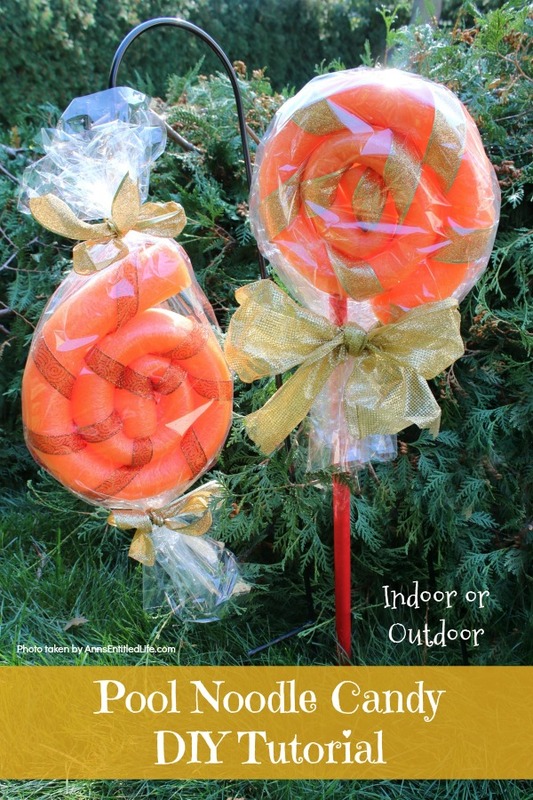 • Place lollipop on top of cellophane. • Cut to fit below the candy, with excess when gathered. • Gather cellophane at the bottom of the candy. • Secure to pipe with wire. 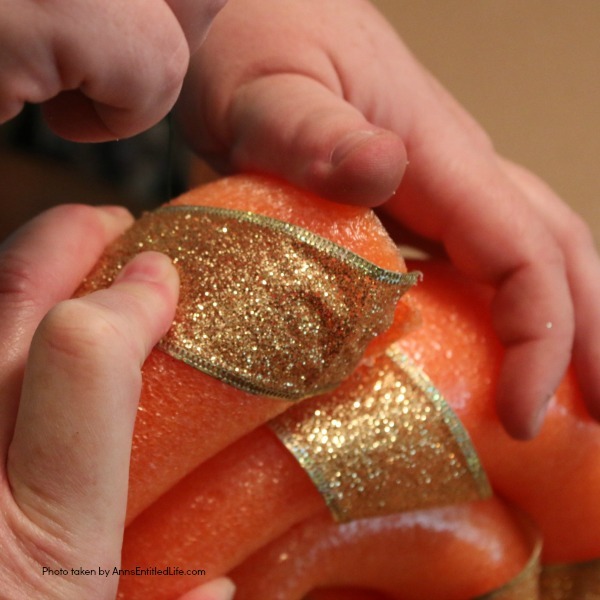 • Tape down (in the back) any cellophane wrap that sticks out and is not laying flat. • Add a bow to cover the wire. 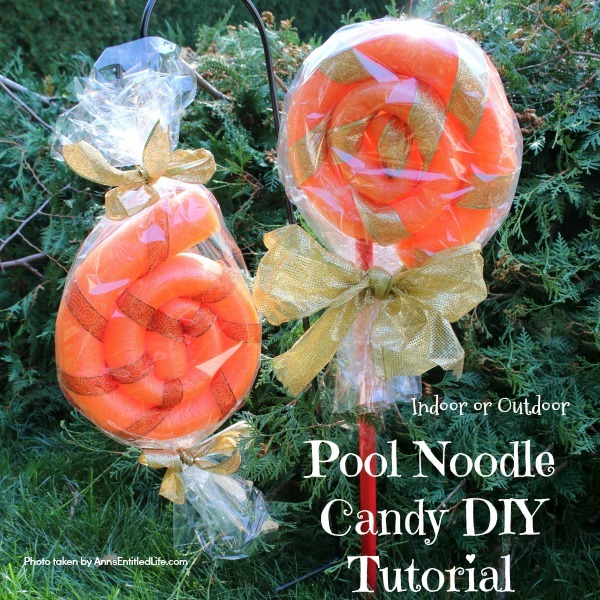 • Bend the pool noodle and start to wind it to form a lollipop shape. Continue until you have wound the whole pool noodle. 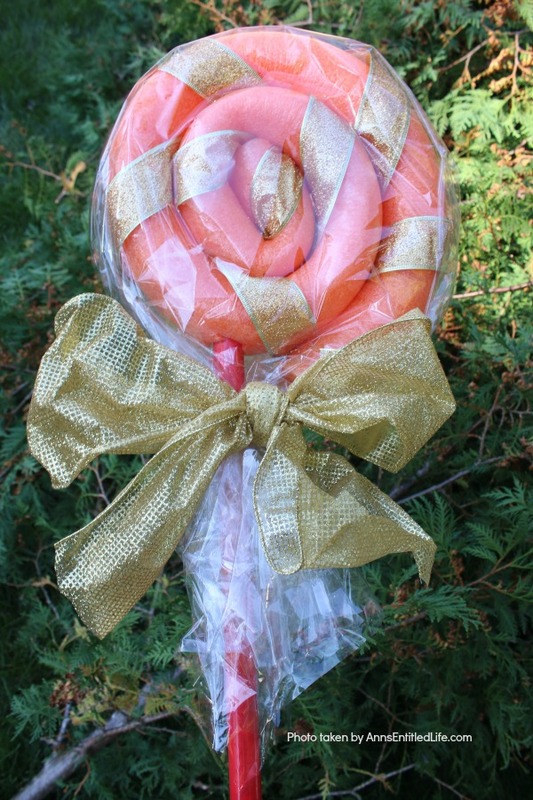 • Place candy twist on top of cellophane. • Wrap like a present. 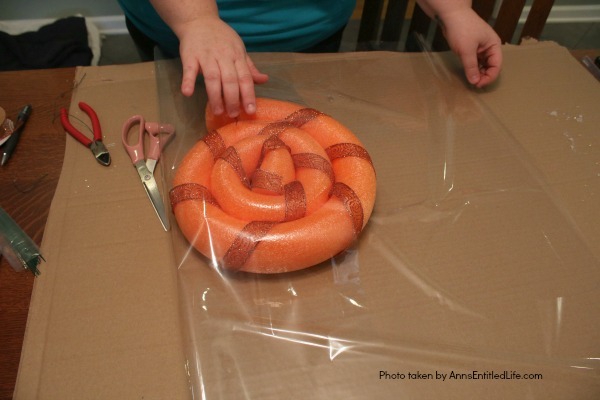 • Gather excess cellophane on both sides. Secure with a wire. • Add bows to cover the wire. • If hanging these, add a wire, pipe cleaner, etc. to the end of one of the sides, and then form a hook.